A memorial scholarship fund in former Haddonfield resident Bobby Fulton’s name has been helping local students each year since 1974 with a single $5,000 grant. However, this year is different, as four local students have been chosen and will be receiving much more financially significant scholarships. Due to a significant bequest from Carlton Horner, a former teacher of Haddonfield Memorial High School, the Bobby Fulton Scholarship Foundation was able to award four students $10,000 each for four years to attend college, totaling $40,000 for each student. One of those students was HMHS’ John Collins III. “Bobby was a personal friend of mine, and doing this in his memory is very gratifying. With this endowment, we’re able to help out more kids this year,” Bobby Fulton Scholarship Board Member Jim Conway said. “I feel deeply honored (to be chosen) … Bobby Fulton seemed like a great man … I feel honored to represent the charity,” Collins said. Fulton was a remarkable young man who excelled both academically and athletically, according to Conway. He was a graduate of HMHS and a Scholar Athlete Award winner, playing basketball and golf. Fulton attended Lafayette College, played on the golf team and was the first freshman to earn a varsity letter since World War II. Shortly after his freshman year in 1973, Fulton was killed in an automobile accident. 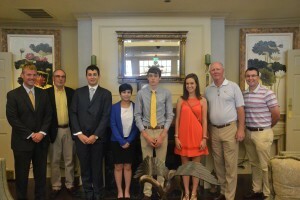 Members of Tavistock Country Club, along with Fulton’s father Robert and grandfather Samuel, decided to form a memorial scholarship to perpetuate Fulton’s memory and provide assistance to local high school graduates pursuing a college education. Scholarships are limited to graduates from select schools in Camden County. The process for awarding the scholarship is extremely competitive, focusing on academic achievement, extracurricular activity and financial need. Because of the endowment, four students were chosen for the 2016 scholarships. Conway said the board received 30 applications and all were the best of the best. “It was a very hard decision … These kids are all so exceptional, all with a 4.0 GPA or better and fantastic extracurricular backgrounds. It was not an easy decision,” Conway said. However, they were still able to narrow it down to Collins, Paula Clemente of Haddon Heights High School, Conor Madden of Haddon Township High School and Isabel Visco of Paul VI High School. They were all ranked among the top five in their graduating class combined with a diverse array of athletic, artistic and community activities. Conway said Collins was chosen as he was outstanding academically, being fourth in his class and taking all high-level courses, and his extracurriculars were interesting. He said one that stood out was being a part of Robotics Club. Collins said he was an officer in Model UN, president of DECA, president of Chess Club, editor of the school’s literary magazine, part of the Principal Advisory Council, troupe leader of Shakespeare Troupe, a member of the Robotics Club, founding member of the Philosophy Club, a member of the Human Rights Council and captain of Academic Challenge. Collins was very grateful to be one of the students chosen for the scholarship. Principal’s Secretary Carol Barbano told him about the scholarship and he said he is grateful she pushed him in the right direction. He is attending the University of Notre Dame and plans to study business. His hope for the future is to run a small business and get involved in philanthropy. “This is such a large financial gift. I’m very grateful. They offered me the opportunity to pursue other adventures in my life and try to help the world back,” Collins said. Clemente, also graduating fourth in her class, was co-president of the Gay Straight Alliance Club, section leader of marching band, captain of Academic Challenge, a member of the National Honors Society, her school’s community service club, and treasurer in her school’s student government. She plans to attend Temple University and study music therapy to help kids and adolescents either in hospitals or at a private practice. “I feel grateful (to be chosen). I am the youngest of three and all of us are going to college together. It’s really expensive for my parents, so I am incredibly grateful I can take this load off my parents and be able to go to college somewhat worry-free,” Clemente said. Visco was a part of the Ambassadors Club, Pro Life Club and Peer Leadership. She is going to La Salle University and majoring in criminal justice with the hope to be in the CIA. Madden shined in academics as well as athletics and arts. He ran cross country and track as well as playing in the jazz and marching bands at his school. He is going to Haverford College and plans to study English. Conway hopes that no matter where life takes them, the students remember the opportunities they were given through this scholarship. The board hopes they give back to others in the future. “We hope in the future they become involved either with our scholarship foundation or some other foundation and pay it forward for kids who come along behind them,” Conway said.